While your book is being written, it is highly recommend that you download backups to your local computer on a regular basis. The server should be backed up as a matter of course, but in case of disaster it is safer to keep your own copies of your work in a separate location. The recommended format for backups is EPUB, because this type of file can be easily re-uploaded and edited, should the worst happen. 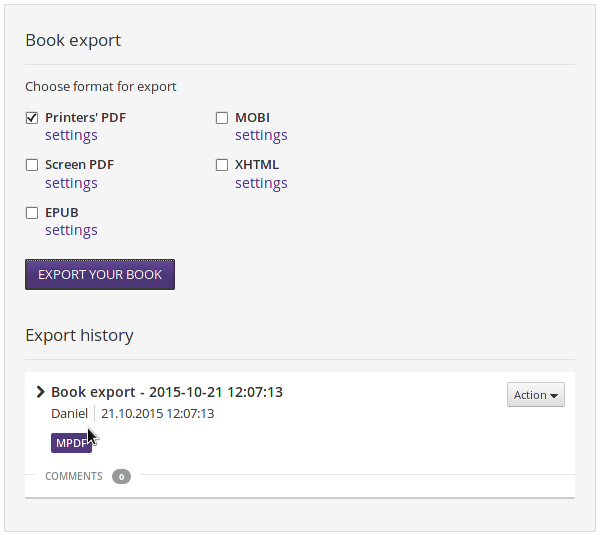 You can export copies of your book at any time from the Publish section, in multiple formats simultaneously. When your book is ready for publication, or if you simply want to download the work in progress, click the Publish button in the top right corner of the interface. 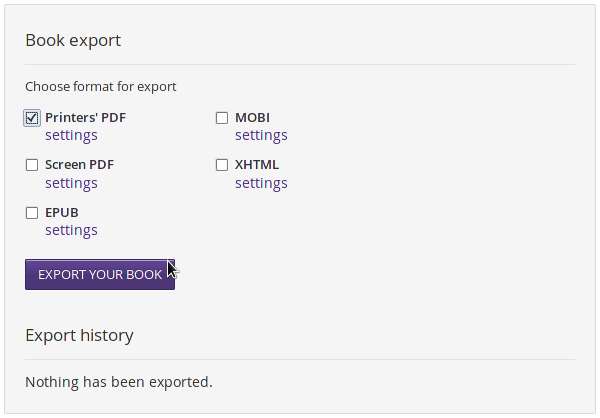 This action opens the Publish section, displaying the Book export, Export history and Book Info areas. The Book Info area displays the description of the book that was entered during the initial creation of the book, or as it was updated in the Book Details page. Each export format has a checkbox to enable it, and a settings link beneath. Before exporting your book to any of these formats, click the settings link to adjust the output parameters, and the pop-up Book Settings wizard will appear. This export format is intended for conventional litho or print on demand book publishing. It offers the best possible control over the appearance of the book pages, which should be printed exactly as rendered. Click the settings link underneath the checkbox to adjust the values for this particular format. In step 1 of the Book Settings wizard, choose the paper size from the drop-down menu of popular formats, or set the width and height of a custom paper size in millimetres. In step 2, set the margins and gutter that you require, or leave the defaults as they are. 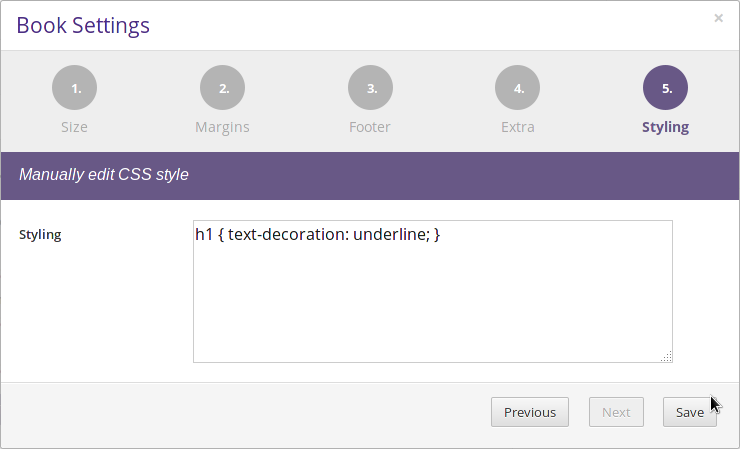 In step 3, enable headers and footers if you wish, and if so, set the margins for them. In step 4, there are extra options relating to Printers' PDF format. When printing backgrounds up to the edge of the paper, it is often necessary to have a bleed area and to crop this from the the paper sheet. Crop marks on the PDF help the printer align the trimming machine correctly. The optional step 5 is for any additional CSS required to adjust the appearance of the book. For example, you might wish all main headings (the H1 element of HTML) to be underlined. Finally, click the Save button to return to the Publish section. Screen PDF exports have the same setting steps as Printers' PDF exports, except that in step 4 a cover image can be chosen, instead of crop mark and bleed options. See Cover Manager in the chapter The Edit Interface for more details. When you have adjusted the settings to your satisfaction, click the Save button to return to the Publish section. 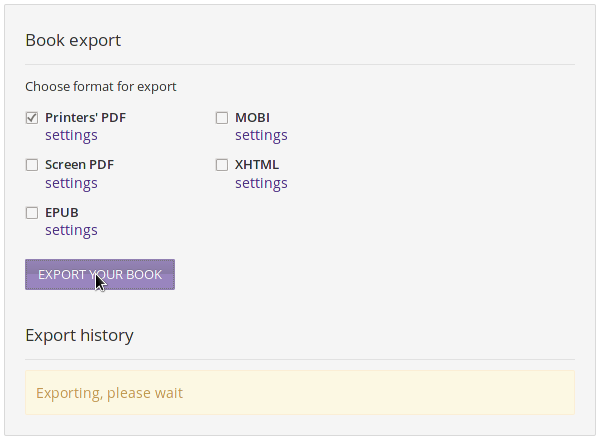 EPUB and MOBI exports have only two setting steps in the wizard, Cover and Styling. 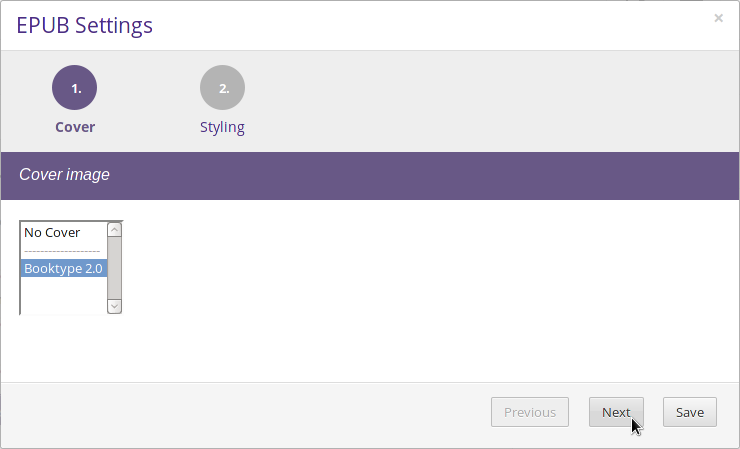 XHTML exports only have the Styling step for additional CSS. Click the Save button to return to the Publish section. 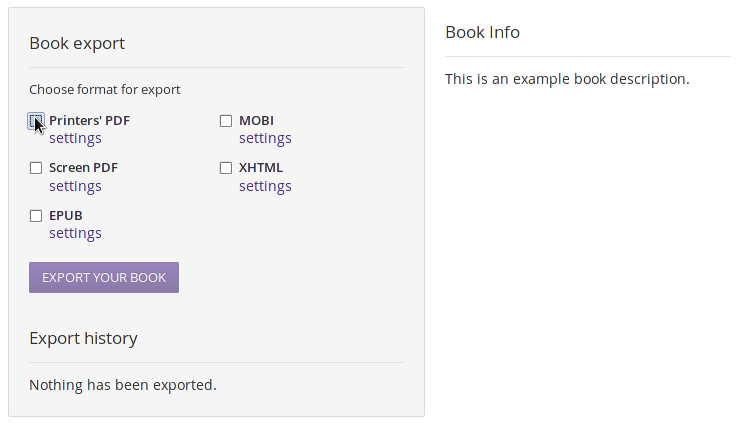 Once you are satisfied with the output settings, check the boxes for the formats you require, and then click the Export your Book button. Depending on the size and complexity of your book, the export can take from a few seconds to a minute or two. The message Exporting, please wait will be shown. 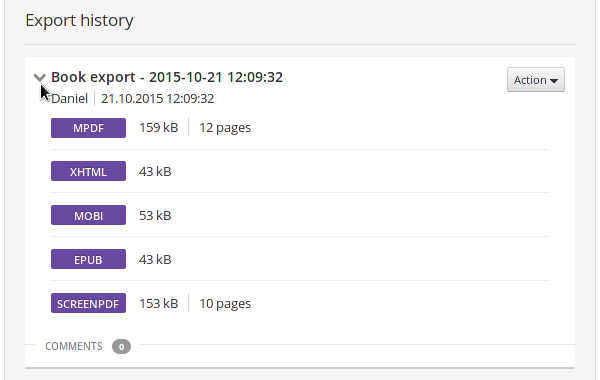 Once the export has completed, the timestamp of the export will be shown in the Export History area. 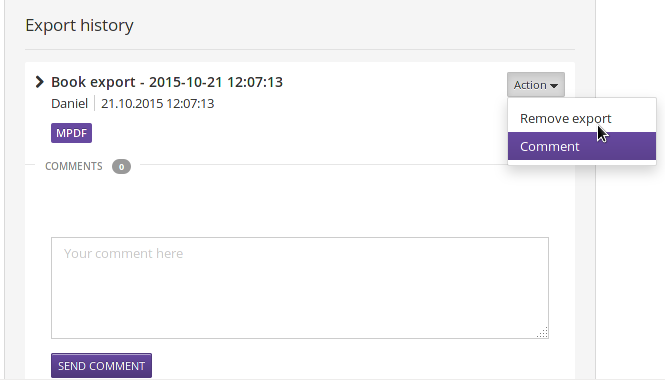 Click on the purple button to download the exported file. Printers' PDF will be shown as MPDF on the download button. If you have exported multiple formats, corresponding download buttons will be shown. Click the chevron to the left of the export timestamp to expand a list showing the download size of each output file, and page counts for PDFs. If you don't want to leave an export on the server for any reason, click the Action drop-down menu on the right side of the export timestamp, then select Remove export. You will be prompted to make sure you really do want to remove it, as all files in this export will be deleted. This action cannot be undone. Alternatively, you can leave a comment on the export for your fellow authors and editors by selecting Comment from the Action menu. 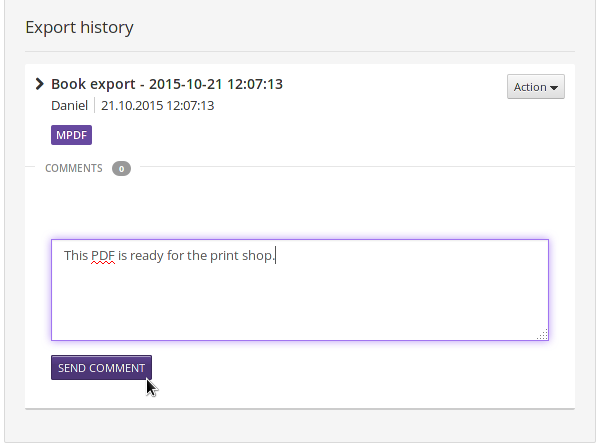 When you have typed in your comment, click the Send Comment button to attach it to this particular timestamped entry in the Export History.